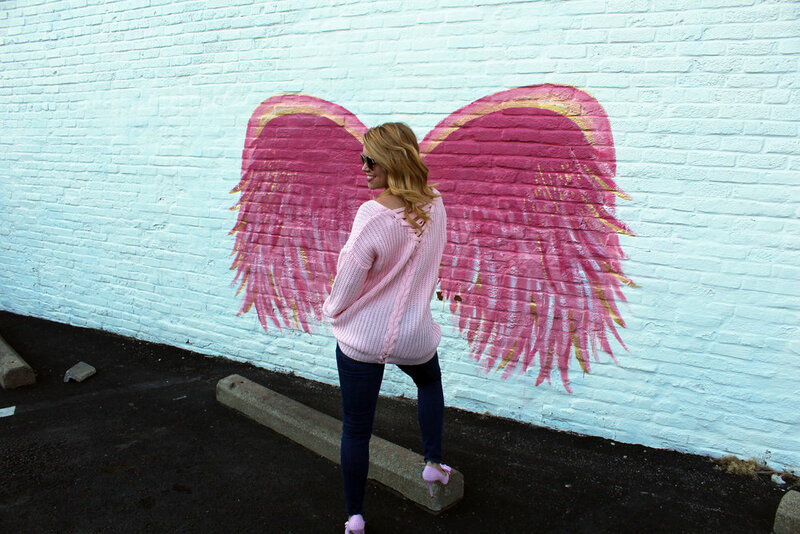 Outfit Details: Sweater: SheIn. Jeans: Paige Denim, Similar. Shoes: ASOS (old), Similar (splurge), Similar. Bag: ASOS (old), Similar, Similar, Similar. Sunglasses: Nordstrom (old), Similar, Similar. Lipstick: MAC in Pink Nouveau. Shades of pink are certainly becoming popular again, and don't you just love the shade of this SheIn sweater? This sweater has quickly become a go-to staple for me as of late. It's cheerful color is definitely needed in this dreary winter weather. The oversized fit makes it cozy, comfy and easily layerable. The lace up detail on the back is obviously super trendy right now, but since it is on the back and missing the gromets that adorn most all of the lace up sweaters I have seen it is more unique and still says Whitney instead of everyone else. Are you embracing the laced up trend? If so, tell me how you are making it your own in the comments below. Be sure to check out SheIn.com for super sweaters at very reasonable prices. Thank you for stopping by!